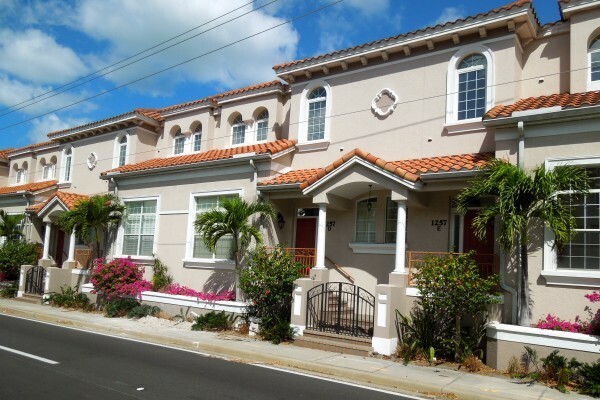 Browse all Encore condos for sale and real estate in Sarasota, FL below! There are only 15 condo units, which means you’ll have all the neighbors you need without too many people in your backyard all the time. Each of these townhouses has a private garage and an open floor plan. These spacious homes accommodate singles and families. These Encore real estate listings are updated every 15 minutes from our MLS system. Contact us if you would like assistance buying or selling a condo in Encore. Read more about Encore condos. This is not a dream. This is what your life will look like living in Encore in Sarasota. This condo development was built in 2004 and it features extreme convenience to all of the amenities in downtown Sarasota. Close your eyes and imagine the lifestyle you’ve always wanted. Spending your days by the beach or on the water, learning to improve your golf game on any number of championship golf courses, shopping in delightful antique shops, and indulging yourself with that second glass of wine at dinner because your home at the Encore condo community is located so close to all of the fabulous restaurants downtown. Encore condos are within walking distance of many shops, restaurants, and entertainment facilities, as well as only minutes from the beaches of Sarasota. Your dream life begins every morning in your luxurious home. It won’t take you any time at all to load your golf clubs into the trunk of your car, or your convertible since that’s what the gorgeous Sarasota weather demands that you drive. Having your own two car garage is great because you can store your golf clubs and your car in there. Work on your game with a golf pro or just spend the day betting your friends so that the loser is in charge of the tab at the clubhouse. Challenge another couple to a doubles match or spend the day on the water. You can either buy your own boat or rent one. You’ll love the idea that you can charter a boat for a day of deep sea fishing or just rent a jet-ski so that you and your loved ones can laugh away the day while enjoying all that beach living has to offer. At night, you can walk to local art galleries for exhibits and perhaps a purchase to decorate your new home. If art isn’t your thing, there are a number of elegant and trendy bars and lounges in downtown Sarasota. You’ll spend more time relaxing, more time smiling, and less time worrying about the day to day stress of living when you’re in Sarasota. The atmosphere is so relaxed that you’ll probably decide it’s time to retire your watch and live life on your own terms.